Construction bonds are a form of a performance bond. Given that modern bonds have their roots in the construction industry, these terms are used interchangeably. A construction bond is a type of surety bond utilized by an owner of a construction project – thus the term construction bonds. It protects against a catastrophic event that would cause a major disruption of the construction project, such as the inability to complete the job by the general contractor, or the general contractor’s inability to pay his subcontractors, or finally the bankruptcy of the contractor. In addition, a construction bond can be a warranty bond to make sure that the job actually conforms to the specifications of the contract. Like a typical surety bond, there are three parties to the bond. First, there is the surety company. This is the company that is guaranteeing the work of the general contractor. The general contractor is the obligor. The person that would be the beneficiary of the bond from a failure of the obligor (the general contractor) is the obligee – the owner of the property. These are many times also called a Contract Bond. It’s a question that we are asked pretty consistently: How do we get the lowest contract bond rate possible? Well, construction bond rates can vary – the rate depends on the type of bond, as well as the bond agency that you end up using. There are a number of ways that you can work to receive lower rates. By following these tips you can work to drive down the cost of your surety bonds. That way, you can make sure that you put more money back into your business or into the construction process (to deliver a higher quality result), as well as have less stress about your business finances. Compare bonds through multiple surety bond companies: certain agencies will be able to offer bonds from many different potential sources. Your bond agent should be choosing from multiple sources, which will allow you to drive the price of your bonds down because you will have more options to pick from. Long-established agencies generally have access to different types of surety bonds, or access to different underwriting criteria, so it’s important to shop around and pick an agency that has more options available to you. 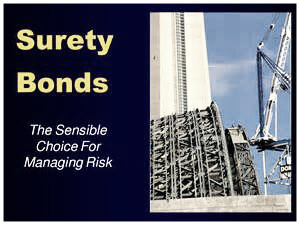 Don’t just consider a single type of surety bond. Some bonds are based on credit rating while others are based on tangible net worth. Go ahead and consider an agency that won’t look into your credit rating: some surety bonds require you to put up your own personal credit rating as well as the finances of your business. Going into a surety bond agency that doesn’t require any of your credit rating, especially if you have a poor credit history, is important to reducing the cost of your construction bond rates. But be forewarned: if you have failed to deliver several construction projects or your business is experiencing some financial difficulty, there can be real problems when it comes to receiving a fair deal on construction bond rates. Look at projects that require cheaper bonds: certain construction projects don’t require the use of performance bonds or other fully-insured bonds. If you can find a construction project that only requires the use of the bid bond you can work to save money off of the total cost of your construction bond process. The less amount that you have to tie up with financial institutions, and the less people that you have to involve in the bond purchasing process, generally means the less cost to you in the end. Pick your construction projects wisely and you can lower the cost of construction bond rates for your company. By using these tactics you can find the lowest rates available. This is typically the total dollar limit that you have available for bonding with your individual company. This is sometimes called your bonding capacity. When you set up your account with your bonding company (surety) you’re usually given two different numbers for your construction bond lines. These two numbers are your single limit as well as the aggregate limit. The single limit in construction bond lines represents the total maximum bid that you can use with a single contract whereas the aggregate limit is the maximum total dollar value of bonds that you can have available for all of your construction work at one time. When you first receive your construction bond line, it is usually represented by just two numbers. You might get something along the lines of 250,000 over 500,000 for a line. Basically what this means is that at any one time you can have construction security bonds out on two projects of $250,000 in value for your company. You can think of the aggregate line as a total credit limit for the amount of bonds that your company can have out whereas the single limit is more of a transaction limit for the total value of a single bond. Essentially these limits act based off of the value of your company to help protect your construction company and you as a contractor while ensuring you can still take out security bonds on any project that you complete. There is no absolute guarantee that you will be approved for security bonds based off of your bond lines. These lines are simply placed as a guide for the maximum amount that you should be considering in any security bonds application. Make sure that you keep within your bond line limits or you could run into problems with your bond agency. If you are extremely limited in your bond lines, a good surety agency will be able to tell you how you can increase your bond line limits (so that you can take on more projects). You can also reduce the total amount of surety bonds that you have out with the help of your surety bond agency. Agents can remove items from your work, which can help to free up more money with your aggregate bond line. It will take some negotiation as well as some help from your surety bond agency but you can make construction bond lines work for your company and understand them when you are approaching surety bond agencies. See our performance bond page for more.